We treat full spectrum of eye diseases in children and in adult patients with special focus on glaucoma diagnostics and therapy. OPTIMUM EYE CENTER is equipped with state-of-the-art diagnostic instruments: Spectral Optical Coherence Tomography, FDT Humphrey Matrix Perimetry, GDx PRO Scanning Laser Polarimetry, HRT3 Heidelberg Retinal Scanning Tomography, Ultrasound Pachymetry etc. Feel comfortable in modern, spacious consultation rooms and patient friendly environment. We perform different laser procedures in glaucoma, retinal diseases and posterior capsular opacities: Selective Laser Trabeculoplasty (SLT), Micropulse Laser Trabeculoplasty (MLT), photocoagulation, micropulse therapy, capsulotomy and iridectomy. We use Lumenis Selecta and Quantel EasyRet lasers. Our paediatric ophthamologists take care of children patients. All consultants in OPTIMUM Eye Center have a long-term clinical experience as well as the highest degree certification in ophthalmology. 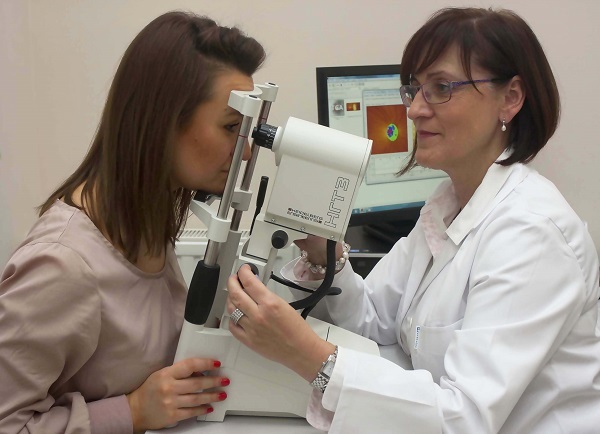 We are all members of Polish Ophthalmological Society. To make an appointment with English speaking doctor please call the reception desk at +48 602 353 107 or +48 22 620 37 40 or send us an email to info@optimumokulistyka.pl and we will call you back. We are open Mon-Fri, from 9 am to 7 pm. Address: ul. Bracka 11/13, Warsaw (see local area map).